Map source: People Group location: Asia Harvest. Other map geography / data: GMI. Map design: Joshua Project. The language and many customs of the Deqen Tibetans are distinct from other Tibetan peoples. One Chinese scholar was "surprised to find that the life and customs of the people of the Deqen Prefecture differ from those of the Qinghai-Tibet Plateau. Besides traditional Tibetan customs, they have developed quite a few of their own." 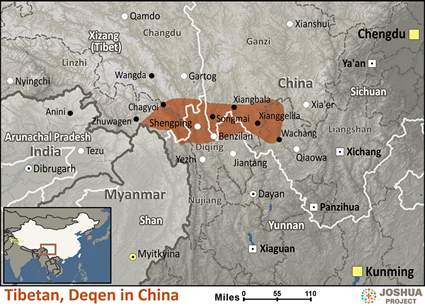 Formerly located in Tibet, Deqen was annexed by the Chinese in 1703 and has since been a part of Yunnan Province. Tibetans had migrated south into the region many centuries earlier. The extreme north of Yunnan is an isolated, mountainous region with abundant rain and snowfall. Hot springs located throughout the region help the people alleviate their winter struggles. Although most Deqen Tibetans are Buddhists, this group also has the largest number of professing Christians among any Tibetan group in the world. Three Deqen Tibetan villages numbering 600 people, located on the Tibetan side of the border, are Catholic. Another 700 Tibetans meet in a large Catholic church in Yanjing. The area was first converted by workers with the Paris Foreign Missionary Society in the late 1800s. The mission reached out in love to people all over the Tibetan world. In 1905 Tibetan lamas killed all of the French missionaries and the head of Father Dubernard was hung on the monastery gate. The Chinese authorities responded by demolishing several Tibetan temples in the region. Around the same time, emissaries of the Dalai Lama were dispatched to a Christian village near Yanjing to order the people to renounce Christianity. They shot several Christian families in a field that is called the "Field of Blood" to this day. Instead of intimidating the believers, this cruel act solidified their faith and helped them to renounce Buddhism. It has remained Christian ever since. By 1922 there were a reported 1,610 Tibetan Catholic converts in the area. The Pentecostal Missionary Union commenced work in Deqen in 1912 but gained few converts. In recent years Lisu evangelists have been sent to the Deqen Tibetans and have discipled hundreds of Tibetans in the ways of Christ. According to a Tibetan priest, Lu Rendi, there are 6,500 Tibetan Catholics in Southeast Tibet and at least a further 3,000 in neighboring areas of Yunnan Province. View Tibetan, Deqen in all countries. 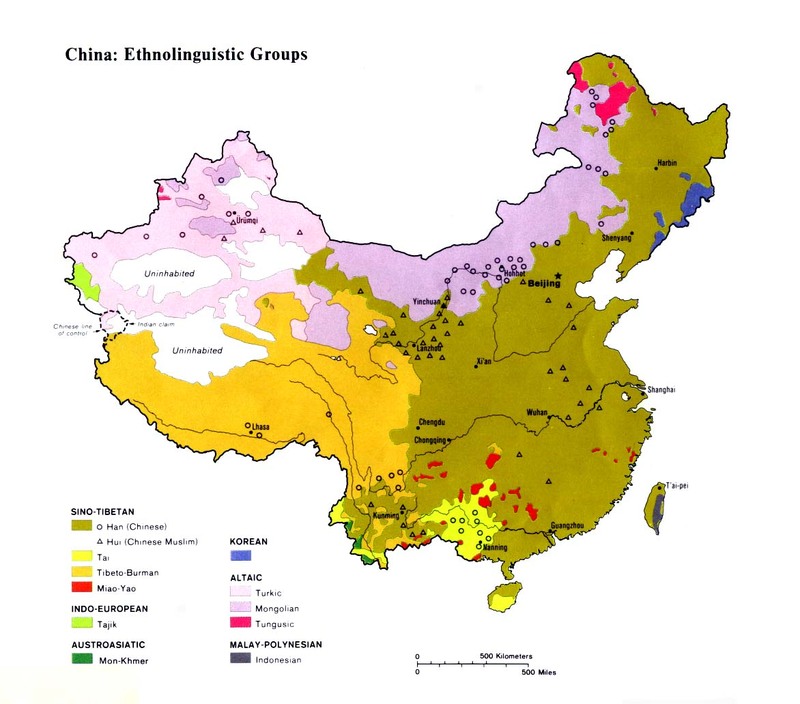 Location in Country: Much confusion surrounds the classification and population of the Deqen Tibetans, whom some researchers refer to as Atuence. 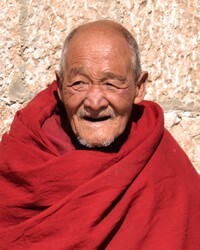 Atuence is the old name for the Tibetan town of Deqen in northern Yunnan Province. Some sources list more than 500,000 Atuence speakers, but our research indicates there are only around 95,000. In addition, there are nine villages of Deqen Tibetans in the northernmost tip of Myanmar.